This one has been on my Kindle since it came out last summer as part of the Falling in Deep collection of novellas. As a mermaid author and fan myself, I checked out the plot synopses of the fifteen stories in the collection, and this is the one I believed I’d enjoyed the most. And it’s also the one that shows up earliest on the also-bought list on my book’s page. The main character is just out of high school, so the book could be closer to the YA style of fiction I write and enjoy. And the main character is transformed into a mermaid, and that plot device and fish-out-of-water (or fish-in-the-water?) element is one I really like. Tara Porter has deferred college for a year to work as an aquarium/water-park mermaid performer, complete with a form-fitting swimmable silicone tail. She and her troupe—employed by the gruff but gentle ex-commercial-fisherman “Neptune”—are touring various aquariums, and the story begins during their stop in Houston. She’s doing a meet-and-greet with aquarium visitors, mostly young kids asking the cute kind of questions young kids ask, and then she and her troupe perform with some dolphins. All her life, Tara wanted to be a mermaid. Her father, who has sadly passed away, encouraged such flights of fancy. Her mother, not so much; she’s not thrilled by Tara’s decisions to study marine biology and not to start doing so until after a full year off. So Tara gets to act out her dream in the mermaid show until an accident renders her unconscious in the ocean where she meets a pair of real mermaids! One is the hunky merman Finn (insta-attraction doesn’t bother me as much as other readers); the other is the eccentric but kind sea-witch Nereia, who does something magical. Tara is gradually turning into a mermaid. This was the part of the story I enjoyed the most. The transformation was drawn out over a few chapters, and that was nicely done as it built stakes in the plot. After her aquarium performance the next day, she discovers she has developed gills. This poses problems for her staying on land, as they’d surely be noticed unless she wore turtleneck sweaters, which would make performing underwater a challenge. Since the troupe is leaving Houston in a few days, the only way to reverse the change is to venture back underwater to find the sea-witch. But before long, Tara’s growing scales and her legs want to zip together into one mermaid tail. Loved these parts of the book. The rest of the story is fun and quick to read, though mostly predictable. With the notable exception of a snapper fish named Ponce, few of the supporting characters stand out. Tara becomes involved in a plan to save a royal dolphin from the aquarium to prevent a war, but I didn’t feel the same urgency with this part of the story as I did when Tara first started changing into a mermaid. Tara as a narrator is mostly interesting. She tells the reader a lot, but is enthusiastic about it. Though she ultimately makes very noble choices, she doesn’t always come across as mature. That’s not really a problem since her character is eighteen and seems to have lived a relatively sheltered life, but it makes classifying this book difficult. I don’t think it’s YA even though older teens could definitely read it as there’s nothing steamy beyond some kissing, but I’m not sure if that’s enough for a New Adult (NA) novel since I don’t read enough in that genre. But still, it’s short and light and frothy, and perfect for a quick beach read. Author Erin Hayes has this book both a part of the Falling in Deep collection and her own Cotton Candy Quintet, which connects some of these characters to witches, fairies, and other magical beings. That could be interesting, especially since they seem about the same length. Until then, How to Be a Mermaid is in clear water at THREE AND A HALF STARS. 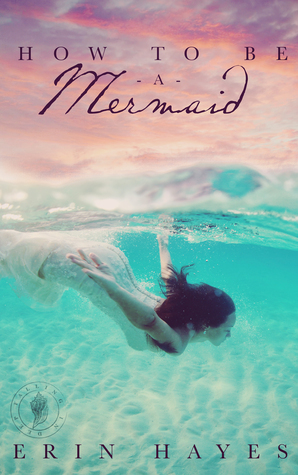 Sign into Goodreads to see if any of your friends have read How to be a Mermaid.